Airsoft is a sport in which participants eliminate opponents by hitting each other with machine guns, spherical non-metallic pellets launched via replica firearms called airsoft guns. Since airsoft pellets do not mark their target and hits are not always visibly apparent, airsoft relies on an honor system in which it is the duty of the person who has been hit to call themselves out regardless of whether or not anyone saw it happen. Gameplay varies in style and composition but often range from short-term skirmishes, organized scenarios, C.Q.B., field, military simulations (MilSim), or historical reenactments. They are played in some indoor courses, and outdoor (fields). Combat situations on the battlefield may involve the use of military tactics to achieve objectives set in each game. Participants may attempt to emulate the tactical equipment and accessories used by modern military and police organizations. 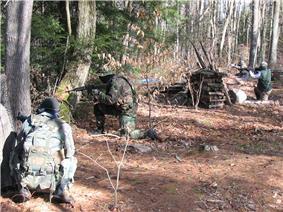 Airsoft originates in Japan. Airsoft guns spread to the UK in the late 1980s with a company called LS. The guns were sold in pieces and had to be assembled before they were capable of firing pellets. Airsoft equipment was designed to closely emulate real guns. Since the mid-1980s, airsoft guns have been adapted with a purely recreational application in mind, and the sport is enjoyed by all ages. Airsoft replicas are produced globally, with the majority being manufactured in Asia. Many law enforcement agencies in the US use Airsoft for force-on-force training drills. On impact, the pain an airsoft pellet causes is directly related with the kinetic energy it has. This energy is directly proportional to its mass and the square of its velocity. It is important to note that doubling the velocity of a pellet will quadruple its kinetic energy. As a reference value, a 0.20 gram pellet traveling at 100 metres per second (330 ft/s) has one joule of kinetic energy. A typical set of velocity for sanctioned fields in the United States on guns may be 110 metres per second (350 ft/s) for Close Quarters Battle (CQB), 120 metres per second (400 ft/s) for outdoor play with fully automatic AEGs, 140 metres per second (450 ft/s) for semi-auto "DMR" style AEG's, and 151 metres per second (495 ft/s) for bolt-action sniper rifles, for a 0.20 g pellet. The maximum effective range of field-legal airsoft weapons is all around 100 m (110 yd) with a highly upgraded sniper rifle replica. Most airsoft guns used for field play will have an effective range of around 43–67 metres, depending on the intended role of the weapon. Most Airsoft guns are capable of shooting from 60 m/s (200 ft/s) to 125 m/s (410 ft/s), although it is also possible to purchase upgraded internals for some Airsoft guns that will enable the gun to shoot up to 170 m/s (550 ft/s) or higher. In California a common limit for CQB is 110 m/s (350 ft/s). In Ireland, Italy, and Japan the energy limit for Airsoft guns is one joule regardless of the type of game play. Some UK sites allow semi-automatic-only weapons up to 88 m/s (290 ft/s) and bolt-action rifles up to 95 m/s (310 ft/s). However, the majority of UK sites allow both semi-automatic weapons and bolt-action rifles up to 107 m/s (350 ft/s). Northern Ireland has a maximum velocity of 100 m/s (330 ft/s) with 0.20 g pellets, without regard to the type of weapon. The ballistics of spring or electric powered airsoft guns differ from real firearms in that a longer barrel will not always result in better accuracy. In spring/electric airsoft weapons, barrel length does not have a significant effect on accuracy. The "sweet spot" for barrel length in a spring/electric powered airsoft gun is around 450 mm. Past that length, added barrel length will not improve accuracy. In any case, barrel quality, velocity consistency, and hopup quality/design are more important factors with regard to accuracy. Added barrel length will result in slightly increased velocity if the cylinder size and compression are appropriate for the barrel length. For example, a gun with a large cylinder and a long barrel will shoot slightly harder than a gun with a small cylinder and a short barrel (ceteris paribus). This rule will apply even for barrels longer than 500 mm, if there is enough cylinder volume and air compression to propel the pellet through the barrel. However, the resulting velocity increase will be hardly noticeable. The only considerable advantage of using a longer inner barrel in an AEG or spring powered gun is that it generally will make the gun quieter. Gas powered replicas function more like real firearms. In gas powered guns, added barrel length (to an appropriate degree) will result in significantly increased velocity, and increased accuracy to a degree. Tighter bore barrels will increase velocity because there will be less space between the pellet and the barrel for the air to escape through. Most stock airsoft guns have 6.05-6.08 mm bore barrels, but best performance is usually seen with "tightbore" barrels, which are 6.01 to 6.05 in diameter. However, the tighter the bore, the more likely the chance of a pellet jam, and subsequently, tightbores need to be cleaned regularly. It is generally agreed upon that a good quality 6.01-6.02 mm barrel will provide the highest muzzle velocity, while a good quality 6.03 mm or 6.05 mm barrel will provide the best compromise between power, accuracy, and ease of maintenance. The actual accuracy difference between tightbore sizes is debatable and usually outweighed by bore consistency. Pdi , Prometheus and edgi tight bores are considered the best manufacturers. Airsoft replica of a H&K G36C. Note that this replica is not in use on a field, and therefore has the magazine removed, the chamber cleared, and a barrel bag placed over the muzzle. 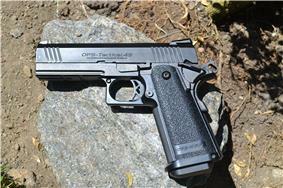 Many manufacturers and retailers suggest to treat an airsoft gun like a real gun at all times. This will help alleviate safety issues resulting in a misfire to an unknowing target or an airsoft gun being mistaken for a real firearm. Most manufacturers include an orange tip on the barrel of the airsoft gun for safety purposes. Manufacturers and retailers urge consumers to not remove the orange tip of the airsoft rifle as it is used to help distinguish them from a real firearm. The orange tip serves many purposes, one of them being for law enforcement to help discern airsoft guns from real firearms. The minimum safe level of gear required to participate in most games includes a pair of Ballistic eye wear ANSI Z87.1 (impact-rated) goggles to protect participants' eyes. Traditional prescription glasses and sunglasses, or goggles not designed specifically for use with airsoft or paintball marker, may break or shatter upon being struck, causing injury to the eye. Airsoft guns are not to be confused with BB guns, which fire metal BBs and are not safe to fire at a person even with protective goggles. Rules such as a maximum muzzle velocity and engagement distance guidelines are used by different groups. Some organizations have created common safety rules and guidelines. When not actively playing, some fields require "barrel bags", also known as barrel socks, barrel blockers, or barrel sleeves, to be placed over the muzzle of the gun. The magazine is usually removed as well, and the gun fired to clear the chamber. Most fields also require players to leave their guns set to the safety position when they are not shooting, a practice common when using real firearms. In certain countries, such as the Philippines, additional special rules have been adopted. Airsoft is legal in most parts of the world. Some countries have specific restrictions, such as maximum muzzle velocity and "unrealistic" colouring to distinguish them from actual firearms. They are legal throughout the United States, but restrictions do exist in certain cities such as Chicago, Illinois and Detroit, Michigan. The states of New Mexico, New Jersey, and Michigan, however, do not allow airsoft guns to be used or handled publicly because of the resemblance to real firearms. They may be used on private property with the consent of the owner. The Customs and Border Protection FAQ page states that Airsoft guns are considered look-alike firearms which require the special blaze orange marking. In October 2013, a 13-year-old boy carrying an Airsoft replica assault rifle was shot and killed by deputies in Santa Rosa, California. In the Republic of Ireland Airsoft guns are classified as Realistic Imitation Firearms but not restricted as much as in the United Kingdom. Under the Criminal Justice Act of 2006 Airsoft guns are legal in the Republic. One can buy, sell and import Airsoft guns without notifying relevant law enforcement authorities. They do not need to be painted in fluorescent colors, they do not need to have an orange tip, but they cannot launch the projectile with a kinetic energy exceeding 1 joule. However, carrying an imitation firearm in public is prohibited, and a gun carry case is required, as for real firearms. Airsoft shops are spread over the country, and buyers must be aged 16 or over to purchase an airsoft gun. There is no age limit on Airsoft, as long as a minor has an adult's permission. In the United Kingdom, some Airsoft guns are classified as realistic imitation firearms or RIFs. The sale, manufacture, or importation of these is restricted to activities that are exempted or have been granted a defense by the Home Office under the Violent Criminal Reduction Act (VCRA). Airsoft skirmishing has been granted a specific defense against the requirements of the act, and a skirmisher as defined under British law is allowed to sell, import and manufacture airsoft replicas, and convert them into RIFs. Purchase from other vendors is not illegal, but the sale is - the crime is committed by the vendor. All are still, however, crimes under British law that can be defended successfully (in theory – this has never been tried to date) by fulfilling criteria suggested in the guidelines accompanying the VCRA. The most accepted method of proving entitlement to the defense is to be a member of a site that holds public liability insurance. 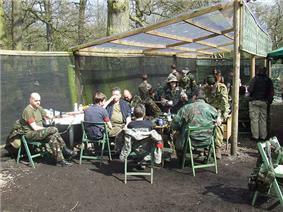 An association set up by UK retailers, called the United Kingdom Airsoft Retailers Association (UKARA), in line with the Home Office documentation accompanying the VCRA, recommends that an airsoft site only give membership to a player who has played at least three games over a period of no less than two months. It is also possible for a member of an insured reenactment society or the film or television industry to purchase an Airsoft replica (this is a full exemption from, and not a defense against, the VCRA). The right to buy a RIF (or IF) is still reserved for individuals age 18 and over. Many retailers are part of the UKARA scheme and will only sell to players who are registered to a skirmish site that fulfills the desired requirements for the VCRA Defense. Retailers must renew their membership annually. The Association has a database of registered players from approved airsoft sites that is updated on a regular basis by the sites themselves. Retailers who are members of UKARA have access to the database and can check for proof of eligibility for purchasing access to the player's site membership number before selling any RIFs to private individuals. Other schemes have been attempted to allow Airsoft players to comply with the Violent Crime Reduction Act 2006, but none have been successfully implemented. The use or possession of any kind of replica weapon—loaded or otherwise—in a public place without valid reason is an offense under UK law and can carry heavy penalties. As an alternative to RIFs, IFs (Imitation Firearms, including 'two tones') are available. These are RIFs which have been painted a bright colour (excluding white/silver/gold) over 51% of the item. No specific defense is required for purchase of IFs. They cannot be bought by those under the age of 18, and offer an entry to those unable to claim a defence under the VCRA. In Canada, there are laws pertaining to airsoft importing. All airsoft guns that are bought in Canada are legal, but when importing it, the gun has to have between 366FPS and 500FPS to pass inspection at customs, otherwise the gun will be shipped back or destroyed. Although airsoft guns in the United States are generally sold with a 6mm (0.24in.) or longer orange tip on the barrel in order to distinguish them from real firearms, this is not in fact required by federal law. Manufacturers and importers may cite Title 15 of the Code of Federal Regulations, which stipulates that "no person shall manufacture, enter into commerce, ship, transport, or receive any toy, look-alike, or imitation firearm" without approved markings; these may include an orange tip, orange barrel plug, brightly colored exterior of the whole toy, or transparent construction (part 272.2, formerly part 1150.2). However, section 272.1 (formerly 1150.1) clearly indicates that these restrictions shall not apply to "traditional B-B, paint-ball, or pellet-firing air guns that expel a projectile through the force of compressed air, compressed gas or mechanical spring action, or any combination thereof." This language clearly exempts airsoft guns from these requirements, placing them in the same category as bb-guns, pellet, air, and paintball, none of which are conventionally sold or used with an orange tip, and many of which bear as much resemblance to real firearms as airsoft guns do. Another difficulty the airsoft-playing community has with a legal or mandatory requirement for any orange-tipped or bright-colored paint on all airsoft guns is that lawless elements could deliberately paint real guns to have orange-tips or make them look like airsoft guns and thus cause more harm or alarm for the public. In certain countries use of lasers of any kind is illegal, thus it is very important to note prior to buying any laser pointers or scopes with integrated lasers, one should always check the country/state laws and ensure that they are not breaking the law. The guns used in airsoft are typically imitation firearms. They have a mechanism for shooting projectiles 6 mm or 8 mm in diameter. Airsoft guns are classified according to their operating principle, which can be spring-loaded, electric (battery-powered Automatic Electric Guns, Airsoft Electric Guns or "AEGs"), or gas-powered (if these have a blowback feature they are known as "GBBs"). Some companies produce full replicas of counterpart grenade launchers which fire a projectile spray of 6mm pellets by use of a high-powered spring mechanism or a compressed gas propellant (i.e. green gas, propane, compressed air, or CO2). There is also a type of airsoft gun known as a "PolarStar" or P* for short. They are powered by a single (HPA) high-pressure air tank and a battery pack to power the internal FCU "Fire Control Unit" computer board. These guns are often known for their high and adjustable ROF or "rate of fire" and durability. Newer guns, especially those made in Taiwan and China, have metal internal and external parts. Japan has specific rules about producing airsoft guns with metal parts. A typical airsoft gun is noticeably lighter than its "real steel" counterpart due to the use of aluminum, alloy, and plastic, though some have weights in them for a more realistic feel. 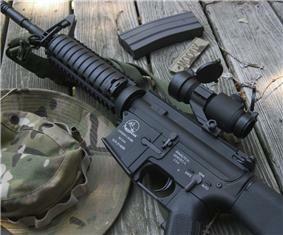 Smoke caps, as well as noise amplifiers, are available for certain airsoft guns to add realism. Gas handgun magazines usually contain 10 to 30 pellets in a standard capacity magazine; however, some are high capacity magazines and can hold 50 rounds or more. In the case of AEG rifles, magazines come in either real-capacity (equivalent to the capacity of its real steel counterpart), low-capacity (10-50 rounds), mid-capacity (75-160 rounds), or high-capacity (190+ rounds). These magazines are spring-loaded. The high-cap magazines often have a ratchet wheel that can be wound up periodically to force pellets up from the holding chamber of the magazine to the feeding chute. Due to loose pellets in the reservoir, they often make a rattling noise when running or walking. Some airsoft guns have a battery-powered box or drum magazine that holds thousands of pellets, but these are usually only used and allowed on LMGs (light machine gun)type replicas. It is common for owners to "tech" or modify their guns. The standard gearboxes are made to Tokyo Marui specs and have upgrade parts available. It is also possible to perform DIY modifications. The "Hop-Up" system, which is installed in most stock airsoft rifles and in some pistols, is used to add extra range by putting backspin on the pellets. The Magnus effect causes them to rise upward as they are fired. A small rubber nub protrudes into the top of the barrel through a small hole, and it catches the top of the pellet as it flies past. Adjusting the Hop-Up makes the nub protrude more or less into the barrel, so that backspin is increased or reduced. Ideally, the Hop-Up should be adjusted so that the pellets fly as far as possible in a straight line without curving upward too far, or dropping to the ground too quickly. Hop-Up does decrease the velocity of the projectile (a gun firing 340 ft/s (100 m/s) with the hop fully unwound can drop as low as 300 ft/s (91 m/s)). Ease and location of adjustment varies by gun design; some weapons provide controls that can be adjusted quickly during gameplay, while others may require partial dis-assembly. For example, a common location for Hop-Up adjustment is where the ejection port would be on a real firearm, which allows the mechanism to be covered while still allowing quick access to adjust the Hop-Up. Most airsoft guns fire round plastic pellets, usually white, but black "invisible" or phosphorescent are common as well. The pellets mostly range from 0.12 to 0.48 g. However, the most popular weights for AEGs (automatic electric guns) and GBB* (Gas Blow-Back guns) are 0.20 g and 0.25 g (*These weights are generally specified for pistols whose muzzle velocity ranges from approximately 250 ft/s (76 m/s) to 400 ft/s (120 m/s)). Heavier rounds (0.30–0.43 g) are typically used in long range and sniper applications since they are more stable in flight and less easily deflected by wind. They are usually bought in bags or bottles of 2,000 to 5,000, but other sizes are available, such as a 250,000 round (65 kg) package of tournament grade pellets. Pellets are typically 6 mm in diameter, though 8 mm pellets do exist. Pellets vary by diameter depending on the brand (e.g. Matrix pellets are 5.95 mm in diameter and let less air slip past it during travel through the barrel, whereas Crosman pellets are 5.93 mm in diameter and allow more air to slip past during travel through the barrel and allow for less velocity). Mid to high end AEGs use 0.20–0.30 g pellets, while sniper rifles work best with 0.30 g or higher. Pellets are used for the majority of play, although foam balls may be used to represent M203 styled grenade launcher shells. 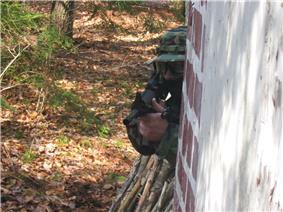 Airsoft technology is used in military and law enforcement training. Due to airsoft’s realism, relatively safe projectiles, and economical ammunition, it suites itself to war games and scenarios to train troops. Multiple airsoft inventions were developed originally for military and law enforcement use. Marking rounds were invented by Kerry T. Bowden to allow trainees to see where each projectile landed. Much like paintball and Simunitions, these marking round BB’s would break upon impact, marking the target with luminescent liquid. Unlike traditional plastic BB’s, marking rounds are heavier to ensure breakage the of the shell on impact. The weight can be adjusted by adding heavier liquid. Marking rounds are critical for trainees because they allow the shooter to see exactly where they hit the target. This allows them to extrapolate their mistakes and improve their aim. Reusable grenades were improved by Scott Frank to emulate the fragmentation of a real grenade in war games and scenarios. The grenade can be loaded with paint or BB’s. It uses a quick release of highly pressurized gas to break the shell and quickly disperse BB’s or paint in all directions. Frank’s grenade, although not the first, aimed to be as realistic and predictable as an actual grenade. He developed a more accurate timing mechanism and secondary safety mechanisms to prevent accidental discharge. Both marking rounds and reusable grenades gave airsoft the edge it needed to enter into military and law enforcement training grounds. The airsoft guns used for training differ from civilian models. Guns manufactured for professional training are made to replicate the weight, feel and sound of its real steel counterpart. In general, professional training airsoft guns are GBB models and enhanced with a weighted blow back mechanism to increase the force of the kick. Although some are AEG’s and are built with a blowback mechanism. They are also outfitted with muzzle protectors that amplify the sound to a decibel level comparable to that of a real firearm. The average FPS for a professional training airsoft guns is higher than civilian models. Economically, airsoft is cheaper than Simunition training. Maj. Benjamin Kratz, Fort Jackson’s battalion executive officer, said that one blank M16 round can cost as much as 32 airsoft rounds. And with decreasing military and law enforcement budgets, airsoft adds a number of necessary practice hours. Before airsoft, paintball was in the spotlight for war games across the world. When airsoft came into the picture, it stole a large population of paintball users. Paintball sales began to plunge. Airsoft is cheaper, has more options, is customizable, and is more realistic than paintball. Airsoft’s investment in equipment and supplies usually requires $250, whereas paintball’s investment averages out to $1,500. Ammunition for airsoft is also considerably cheaper than paintball. Due to lower costs, more customization and heightened realism, airsoft has affected the paintball market. ^ "Patent US20140342858 - Airsoft Marking round", "Patent US20140342858 - Airsoft Marking round." Google Scholar. 20 Nov. 2014. Web. 27 Sept. 2015. ^ "Patent US8485101 - Reusable Grenade. ", "Patent US8485101 - Reusable Grenade." Google Books. 16 July 2013. Web. 27 Sept. 2015. ^ "Soldiers Test Integration of Popular Civilian Game into Pre-deployment Training. ", Reeves, Steve. "Soldiers Test Integration of Popular Civilian Game into Pre-deployment Training." www.army.mil. U.S. Army, 12 Aug. 2009. Web. 27 Sept. 2015. ^ "Paintball & Airsoft. ", "Paintball & Airsoft." ANSOM [Army, Navy, Supplies, Outdoor Merchandise] June 2008: 42. General OneFile. Web. 29 Sept. 2015.